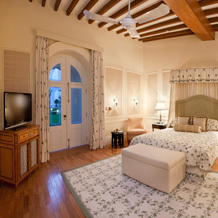 Taj Falaknuma has many offers for its variety of Rooms . Depending on the price range once can choose the luxury one wants to experience. The room price at Taj Falaknuma starts from Rs. 20000.00(inclusive of taxes , inclusive of Breakfast) for a Luxury Room and goes upto 1,20000.00 (inclusive of taxes , inclusive of Breakfast) for a Grand Royal Suite. Though the rack rates are very high. You can get the rooms at above prices from LHW, which offers the best rates for Taj Falaknuma as its a LHW partner hotel. Rate extendable on pro-rata basis: Accommodation for 02 nights (inclusive of breakfast at All day dining restaurant) ,one way airport transfers in a hotel car, traditional welcome and non alcoholic welcome drink on arrival . Historical walk of the Palace,15% discount on Spa treatments,dinner with Chef's Crafted Hyderabadi menu at Adaa once during the stay. 15% discount on Food & alcoholic / non alcoholic Beverage, Laundry, telecom, car rentals. Second room for 2 children below 12 yrs of age at 50% of the double occupancy rate. Taj Holidays Summer Offers are valid for stays between 01 April 2013 and 30 September 2013. Rates are valid for minimum stay of 2 nights. Confirmation of rooms is subject to availability. Room reservation based on allocation of rooms on these special offers. The above offers are valid for Indian and Foreign Nationals. Rates are not valid for group bookings and conferences. Outdoor recreational activities included in the offers will be provided subject to weather conditions. Sightseeing does not cover Monument entry and photography charges. Extendable on pro-rata & Includes: Accommodation for 02 nights (inclusive of breakfast) ,one way airport transfers in a hotel car, traditional welcome and non alcoholic welcome drink on arrival . Heritage walk of the Palace with glass of sparkling wine . Extendable on pro-rata & Includes: Accommodation for two nights on double occupancy. Transfer to the hotel in a hotel Car. Late & lazy breakfast in bed. Heritage walk of the Palace followed by glass of sparkling wine. One exclusive dinner at an intimate location with a bottle of house wine. A private consultation and a 1 hour body massage for the couple at the Spa. one half day escorted sight-seeing tour (entry fees to monuments and other charges as applicable to be borne by the guests) . One round of Cigar & Cognac in the evening with our compliments. A different turndown amenity in the room every evening. Hand picked in room amenities such as scented candles and aromatic oils. In -room bath set up from the exotic Bath menu on any one night during the stay. Complimentary use of Spa wet areas. 15% off on SPA services, Food & alcoholic / non alcoholic beverage, Telecom, Laundry and Car rentals. So you know now where to go for that luxury holiday. Taj Khazana is a luxury lifestyle boutique that showcases artefacts and collectibles created by master craftsmen of India. Entering the store at the recently restored Taj Falaknuma Palace Hyderabad, is like discovering a hidden treasure. The boutique is part museum, part store with artefacts from across the country, truly celebrating Indian culture and tradition. From miniature paintings to designer garments, jewels and handbags, the store houses a fascinating blend of forgotten arts and an unforgettable tradition. To quote Mark Connolly the Style Director of Conde Nast Traveler after a recent visit to Taj Khazana at Falaknuma Palace "The gift shop was filled with sumptuous beds and linens, exquisite jewellery, and magnificent clothing-all the things you dream of finding but never can. I wanted to move into that shop. It was divine." Have a great shopping experience within the luxurious hotel. With a long-standing history of hosting European Monarchs, Heads of State and visiting luminaries, Taj Falaknuma Palace is no stranger to the grandest of events. Be it weddings, receptions or anything you deem special, our venues include the stunning Durbar Hall, the Jade Room, the massive 101-seater Dining Hall and assorted gardens and terraces - venues well acquainted with the art of celebration. Get our skilled staff to cater not only to your every need but also to cull the best gastronomic experiences that have been the hallmark of Taj chefs around the world. Just 20 minutes from the airport are corporate venues dedicated to the art of mixing business with pleasure. 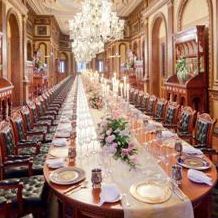 At Taj Falaknuma Palace, the Board Room seats 17 over a comfortable expanse of 900 square feet. Equipped with the latest in video conferencing and display devices including a 52-inch LCD television, the Palace also has the conveniently situated Breakaway Room which provides a relaxed setting for some good old-fashioned networking over themed afternoon teas. 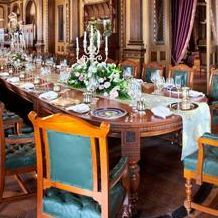 Depending on the size of your group, you can also use the Durbar Hall to seat 50 or take your tea in the exquisite Jade Room, which has played host to visiting European royalty and Indian dignitaries through the centuries. The natural layout of this Scorpion-shaped Palace provides plenty of opportunities to celebrate old memories and make new ones. Your occasion to celebrate is our opportunity to commemorate and we want to make sure that old-world charm and new-world amenities provide the perfect backdrop to your customized celebration. Whether it is birthdays, graduations or even promotions, let our experienced butlers, chefs and service staff help you in directing and planning your event to the last detail. If the Nizams made the otherwise mundane rituals of bathing and eating a spiritual, complex and subliminal journey, can you imagine the splendour, intricacy and care with which weddings were planned? In a culture adept at catering to the needs of discerning royalty no detail is too specific, no demand too outlandish and no request too unattainable. Be the architect of your own royal wedding as our range of services and venues all over the Palace give you the ultimate blueprint to spin a dream wedding of your own. Celebrate your union at our 9000 square feet Rajasthani Gardens, created and conceived by the Nizam himself. Or take the plunge in front of teary-eyed friends and family in the gold-hued Durbar Hall, one of the most spectacular rooms in the Palace which has been inspired by the mythological Indra Bhavan. Let your vision come to life with the help of our staff because we want it to be an experience you and your loved ones will never forget. THE DURBAR HALL : The jewel in the crown at Taj Falaknuma, the Durbar Hall is a visually stunning venue where gilt-edged detailing and warm tones take on a whole new meaning. With enough space to comfortably accommodate a hundred guests, the 2000 square feet Hall makes for a spectacular royal setting to your event. THE 101 DINING HALL: Get cozy with a hundred others in this, the world’s largest dining table. Built in seven parts, the 101-seater provides a sit-down dining experience that is quite literally unmatched anywhere else in the world. 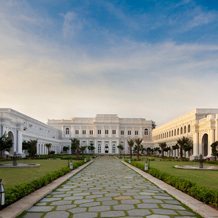 THE RAJASTHANI GARDEN :Amid authentic Rajputana architecture, a spectacular fountain and immaculately manicured lawns, this personal project of the Nizam can host 150 for cocktails and 80 for banquet-style seating. So Celebrate with royalty in above venues. At the heart of Taj Falaknuma is a commitment to procuring only the finest ingredients locally and also from around the world. You can engage with different dining experiences at Taj Falaknuma's Indian, Western and Asian restaurants. You can also opt to go off the beaten track with unique dining experiences with "Shikaar ka Khaana", "Shahi Dastarkhaan", The Royal Terrace and the Hookah Lounge. has an Indian restaurant serving traditional Hyderabadi cuisine with a contemporary touch. Our All Day Dining restaurant serves classical Italian and Mediterranean cuisine with essential Jade Room.The Jade room’s history precedes its reputation for having favours of the east. The terrace is a spectacular venue for hosting private dinners as it offers breathtaking views of the city far below.The breathtaking views of the 400 year old city and the palace make this venue an ideal location and a magical setting for a romantic candle light dinner. The terrace pathway is dressed in fragrant jasmine and dimly lit with tradtional labras, at the end of which a table is set with heavily embroidered silk overlays, finest crystal glassware and gold cutlery. Atmosphere is laced with scent of exotic flowers and rose petals showered in the periphery. Your personal butler takes care of you throughout the evening serving epicurean delights from a specially crafted chef’s tasting menu. Soldiers with mashals in their hands align the entrance to the romantic setting of the Chowki dinner (traditional low level seating.) In the distance, a troupe performs a symphony of Suf Qawalis. A six course traditional gourmet meal is served by the royal butlers followed by a tasting of favored hookahs. Amid the beauty of silks and satin Persian rugs and in the light of beautiful candlebras, is an experience as divine as the culinary offerings are wide. ‘Shahi Dastarkhan’ has been recreated down to the last, romantic detail and provides an unforgettable glimpse of the dining experiences of the Nawab himself. Allow the Palace Butlers to fuss over you as they serve you course-by-course in true, time honoured tradition. This six-course traditional gourmet meal features some of the Nizam's culinary favourites served by staff who will quietly withdraw when privacy is needed. And no ‘Shahi Dastarkhan’ experience can be complete without Sufi instrumental music, traditional dance performances and extravagant fireworks. The culinary experience at Taj Falaknuma Palace recreates the passionate relationship between monarchs and their cuisines. Inspired by centuries of indulgence, we will take a leaf out of those experiences that have captivated the Nizams and their distinguished guests. We will recreate and reinterpret tastes and traditions of a bygone era, while keeping contemporary palates in mind. If you're partial to your poison, then the Palace also has a staggering collection of the rarest whiskies, single malts, luxury vodkas and cognacs, including Louis XIII, supplemented by an unrivaled selection of the finest handmade cigars from all over the world. You will find molten gold and amber in the Palace treasure chest. Our elaborate wine lists have been carefully put together by our Sommelier and you can depend on our guidance to select just the right wine for that course or event. Special tasting menus can also be arranged. With an Approx Rs. 2000 for two (without alcohol), VAT & Service Charges extra , enjoying the luxury with delicious food leaves one satisfied with the whole experience. 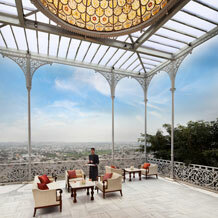 Capture the heart of a Palace built for the soul of a Nizam as we take you on a journey woven by the threads of time. Taj Falaknuma is not just a Luxury Hotel but a palace with such beautiful piece of work which is delight to you eyes. The Jade room’s history precedes its reputation for having favours of the east played host to the world’s most sought after dignitaries and for being one of the most magnifcent venues at the palace. Royal receptions were held for dignitaries such as Prince of Wales, later King Edward VIII. The room has been used for showcasing the timeless collection of precious gems and art from around the world. The Victorian style hand painted ceilings, Belgian cut glass chandeliers coupled with the breath taking views of the 400 year old city make the jade room an ideal venue for the Nizam’s most beloved ritual – Afternoon Tea. Here you can select from our exquisite selection of Palace Afternoon Tea options. elegance of the Past, as it takes you through some of the world’s finest handmade tapestries, French brocades, royal portraits, beautifully crafted, inlaid furniture from Kashmir, porcelain of the highest quality, objet d’art from different corners of the globe as well as crockery from the Nizam’s personal collection. Even if you read a book a day, it would still take you more than 16 years to go through the entire collection of the rarest books and manuscripts which make up the Palace Library. 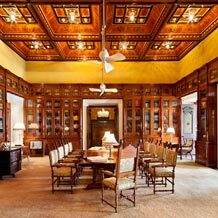 A replica of the one at Windsor Castle with its teak and rosewood book-lined walls, the Imperial Library at Taj Falaknuma Palace has something for every book lover as it traverses both time and subject. Included in the 5900 books on literature, art, history and religion are First Editions of the epic romance Titanic, Encyclopaedias from the turn of the last century and one of the most revered and acclaimed collections of the Holy Quran in the country. Enjoy a leisurely walk through the Palace and admire the receptions, the room exudes a charm of an era gone by. The Champagne Palace Walk starts at the hour of sunset but ends in an altogether different time. A time when the Nizam was rumoured to be the richest man in the world. A time when polo playing royalty, martini-soaked lunches and princesses in billowing chiffons with emeralds the size of chandeliers played a part in tales of royal debauchery, extravagance, drama and deception. The Palace Historian will recount astonishing legends and myths about a dynasty mired in romance and mystery, set in the fitting milieu of palaces, wealth and women. Boys will be men in the Palace’s Smoking Room, an area off-limits to women even today. An ode to exaggerated whimsical masculinity, this room is distinctive with its patterned leather walls, timbered ceiling and is finished in rich mahogany wood. If cigars aren’t your thing, walnut wood screens give you semi-private access to a range of beautifully crafted ‘hukkas’ transporting you to an era where smoking was as much an art as it was a way to pass the time.With walls covered entirely with patterned embossed leather paneling and a rich mahogany fnished timber paneled ceiling, this room Showcases a original hookah from the Nizam’s personal collection. If all you have is a day or two to feel and look the part of a Hyderabadi nawab, then that is all the time you need. Your valet or concierge can organize custom-made Sherwanis in beautiful fabrics and flattering silhouettes. It can be turned around almost overnight in a city noted for its contribution to Indian fashion, and all at good prices. In the past, if you had ever trespassed His Highness' Private Chambers, the consequences would probably have been grave. 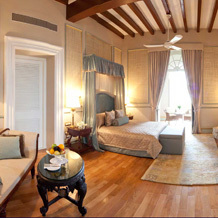 The Grand Presidential Suite was once the sanctorum of the Nizam, a man once thought to be the richest in the world. It is arguably the largest Presidential Suite in the country and by virtue of its former resident, the most magnificent - a place where royalty is celebrated in its purest and most unimaginable form. The Suite is a self-contained oasis of luxury, a declaration validated by the presence of a private swimming pool, a private Jacuzzi, ornate furnishings and soothing marble fountain. It is where the past breathes the same air as the present, where intricately detailed restoration work rubs elbows with state-of-the-art facilities and experiences. Evidence of Her Highness Princess Ezra's personal dedication to its restoration can be seen everywhere, right from the custom-designed furnishings from Turkey, to the Cararra marble floors, which make up the bathrooms. The stately duplex suite with a private pool and an exclusive access to Jiva Spa overlooks immaculately manicured gardens. It is beautifully detailed and complete with every imaginable convenience from state of the art amenities to a personal butler. 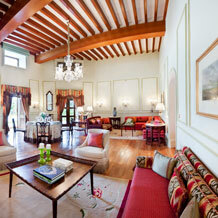 Nothing can beat this Grand treatment in the Grand Presidential Suite of Taj Falakunma. Luxury at its peak. Even though you are 2000 feet above the city, the Palace's Grand Royal Suites will catapult you to a different kind of high. Spectacular panoramic views impatiently duel with the lavish artistry of the interiors as both compete for your attention. As a symbolic reminder of Islamic traditions gone by, we have retained the separate privacy section of the Begum Suite, designed for a time when women were meant to be unseen, private and in purdah. Additionally, the carpets in these Suites have been custom-made in Turkey to complement the existing upholstery. 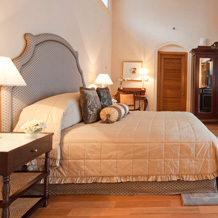 These 3 suites have spectacular views and are beautifully detailed with traditional fourishes. One of the grand royal suites named the “Begum Suite” situated in the Zenana Wing retains its original character and architecture. 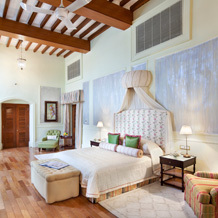 The Royal Suites with opulent furnishings and intricate architecture are located in the Zenana Wing. The timber used all across these rooms are well seasoned 120-year-old Burma teak. décor are part of the Zenana section of the palace. Each of these rooms has been restored keeping in mind the original look and feel from times gone by. Enjoy the Royalty of Nizam's in these Royal Suites at refurbished Falaknuma Palace - Taj Falaknuma ,Best Luxury 5 Start Hotel in Hyderabad. Owing to their location in the Scorpion-shaped palace, Taj Falaknuma Palace's Historical Suites are also called Pincer Suites. Time stands still in delicate Edwardian artwork, antique furniture, grand high ceilings and luscious fabrics personally handpicked by Her Highness Princess Ezra. There are 3 Historical Suites which present a warm and welcoming ambience with wooden foors, exquisite artwork and fabrics along with antique furniture. Book one of these 3 Historical suites and relive the history of Nizams and Falaknuma Palace in Taj Falaknuma , Hyderabad. The Nizams of the past would wholeheartedly approve of the Palace Rooms in all their opulent glory. These rooms are about richness, beauty, perfection and luxury, all of which have been channeled through the medium of royalty. You can see the commitment to these ideals in the rich fabrics, gleaming oak wood floors, hand-painted walls and its literal reflection in the bathroom's mirrored tiles. Enjoy the Riches of this beautiful luxury palace room in Taj Falaknuma, Hyderabad and get in a world of your own. comforts for the discerning traveler. 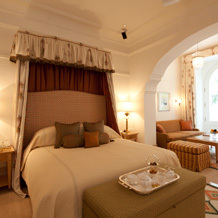 Book one of these Luxury Rooms in Taj Falaknuma to enjoy the Luxury and Heritage at same time. Taj Falaknuma is having various kind of Rooms and suites in its well designed Falaknuma Palace. Falaknuma Palace which boasted of more than 200 plus rooms are re-engineered to give way to 60 different ways to feel like royalty in 60 breathtakingly luxurious guestrooms and suites. Each Room and Suite in it self is an art which can be seen and experienced for hours. This makes Taj Falaknuma one of the best luxury hotels in India. The renovation of Falkanuma palace to this beauty has preserved the royalty and heritage and yet giving the modern touch and luxury. From replicating the chatoyant tapestries made of metallic copper yarn to refurbishing the Venetian chandeliers, each detail has been carefully restored under the personal supervision of Her Highness Princess Esra. Taj Falaknuma is very nearby to Charminar.This luxury hotel is located in Hyderabad (Falaknuma), close to Nehru Zoological Park, Charminar, and Chowmahalla Palace. Local attractions also include Salar Jung Museum and Sudha Cars Museum. 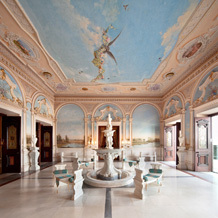 Taj Falaknuma Palace is listed in the 2012 Condé Nast Traveler Gold List of the world's best places to stay. The Taj Falaknuma Palace, Hyderabad has been voted the number 1 Overseas Leisure Hotel in Asia and the Indian Subcontinent and has been voted as 7th best in the World's Top 100 category. Televisions come with satellite channels. Guestrooms also feature refrigerators, DVD players, and safes. In addition to 4 restaurants, Taj Falaknuma Palace features other amenities like a rooftop terrace and a concierge desk. 1 866 Wow 1 Taj (1 866 969 1 825). 00 800 I Luv 1 Taj (00 800 4 588 1 825). Taj Falknuma is one of finest place in Hyderabad , Andhra Pradesh if one wants to revisit the history, retrace the steps of Nizams , enchanting begums but at the same time enjoy the luxury of the kings. Taj falknuma is now rated one of the finest Five start hotels in Hyderabad. It also features in top list of luxury hotels in India. 2000 feet above Hyderabad, Taj Falaknuma Palace's 60 beautifully refurbished and lovingly restored rooms allow you to journey into the clouds and into the glided ages, where grandeur and excess is celebrated and savored in equal measure. The former residence of the Nizam of Hyderabad, Falaknuma Palace has been rightfully leased by the Royal Family of Hyderabad to the Taj Group of Hotels Resorts and Palaces with Royal Family members having personally supervised part of the Palace's refurbishment. 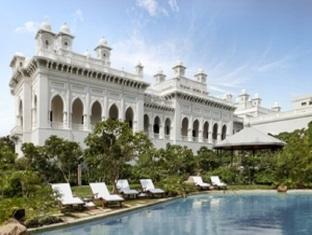 Guest can now experience the famed Nizam's hospitality which was once the sole preserve of royalty. Falaknuma Palace is also known as the ’mirror of the sky‘ (Falak - Numa means 'Like the Sky' in Urdu) because at 2000 feet, it was built in the clouds and reflects the ever-changing moods of the sky. Set in 32 acres of land and spread over 19400 square meters, the Palace was commissioned by Sir Nawab Vikar-Ul Umra, a Hyderabadi nobleman from the Paigah family. Each was the ruler of their own court, built their own breathtaking palaces and each commanded their own private army. 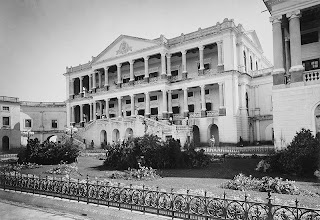 The Falaknuma Palace was so costly to build that even Sir Viqar Ul Umra had to borrow money to complete it and realized that he had gone beyond his means.It caught the eye of the seventh Nizam of Hyderabad, Mahbub Ali Pasha, Sir Vikar's brother-in-law, who was rumoured to be so smitten by the Palace that Sir Vikar, his prime minister, had no choice but to succumb to time-honoured tradition and offer it as a gift or ’nazar‘. Built in 1894, it took ten years and four million rupees for its magnificent, physical evolution in the shape of a scorpion. 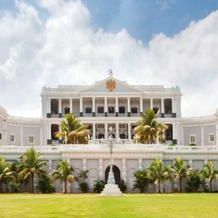 Designed by British architect William Mard Marret, the Palace took a rumoured 22 years to perfect and has been owned in turn by Sir Vicar-Ul-Umra, PM of the State of Hyderabad, Nizam Mahboob Ali Pasha and Mir Osman Ali Khan Bahadur. 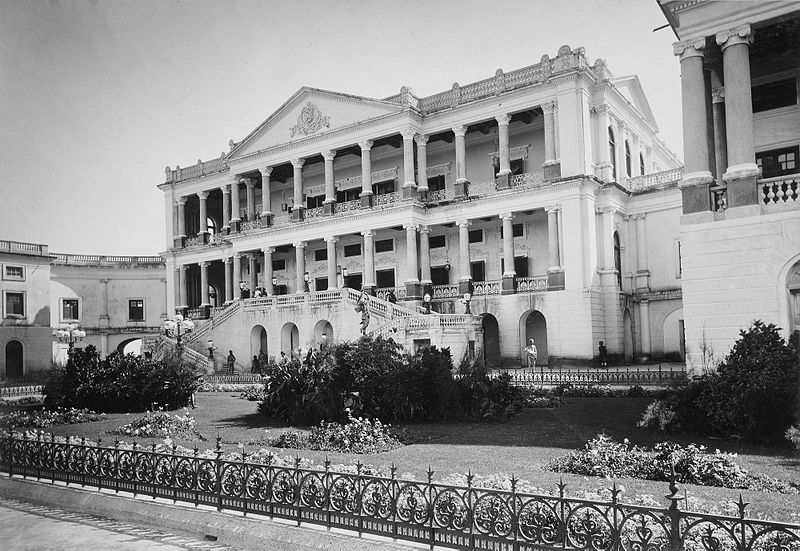 Bought over in 1895 and used as the residence of Nizam VI until 1911, Falaknuma Palace later went on to be used as a royal guesthouse for dignitaries, including free India's first President Dr. Rajendra Prasad who availed of its famed, lavish hospitality in 1951. 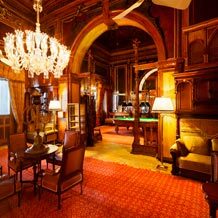 The echoes of visiting European monarchs, the Duke of Windsor, heads of state and distinguished governors can still be heard in this newly refurbished inner sanctum of Hyderabad. Piecing together Falaknuma’s past glory was perhaps the biggest challenge of the restoration. These came with other challenges like retaining the eclectic blend of Renaissance architecture, Baroque style, French charm, art deco sensibilities and other inspirations that were woven into the décor of the palace — yet retaining its true-blue Nizam flavour. The restoration was extensive — sourcing the perfect upholstery to redo the sofas and chairs, choosing fresh drapes to match the taste of the Nizams, polishing the marble, repairing damaged pieces, recreating broken structures, and blending in new wings and spaces for more rooms, extra landscape, and additional restaurants. The Falaknuma Palace has other unique things to its credit. It includes the largest collection of Venetian chandeliers. It is said that it took six months to clean a 138-arm Osler chandelier and the palace has 40 such chandeliers adorning the halls. Since 1995, The Taj Group of Hotels has sensitively restored the palace not only to accommodate the privileged in 60 glamorous rooms and suites, but also to accommodate the extravagance of the ’then‘ with all the comfort of the ’now‘. The renovated hotel was opened in November 2010.